I’ll begin this article by saying that even though the MCU version of Thanos will be the primary example discussed here, we could easily replace him with any number of other villains in any number of other media. Even when limiting the pool to just Marvel movie villains, a glance back at recent years reveals the likes of Ultron (Age of Ultron), Apocalypse (from X-Men:Apocalypse), Kaecilius (Doctor Strange), and Malekith (Thor: The Dark World). These are all villains who, like Thanos, seek apocalyptic aims. Sometimes such villains are genuinely nihilistic. The comic book version of Thanos literally worships the personification of Death. But some of these villains are not truly nihilists in the existential sense. Unlike Thanos in the comics, the MCU Thanos doesn’t believe there’s no value in life. Indeed, despite his willingness to wipe out half of planetary populations, his sincere philosophical argument is that it’s actually in the service of life. Thanos and others like him often use words and concepts like “balance,” “purification,” and “starting over.” Overpopulation is the focal point in Infinity War, but the corruption and wickedness of humanity is also a common pretext used by other villains who share messianic delusions. Humanity has lost its way, they typically argue. If things are allowed to keep running their course, the result will be extinction of not just the human species but of other species and the natural world. As extreme as it may seem, this is a necessary evil to give life a chance. When such villains are given good dialogue and are played skillfully (Josh Brolin’s Thanos is indeed the best MCU villain), the results can be quite compelling. Many viewers may have found a part of themselves wondering if, on some level, Thanos might be partially right. Troublingly, this attests to the power of raw charisma combined with eloquence and how, with enough of these qualities, you can almost convince people of just about anything. Unlike in the MCU, in the comics Thanos is a bona fide nihilist and literally worships Death, here appearing in her human-like form (image: From ‘The Infinity Gauntlet’ / Marvel Comics). This, coming from a lyricist who, in other songs, often marvels at the mystical wonder of the human experience. “AEnema” underscores the frustration that even those who believe in the basic goodness of humanity feel from time to time. The chief difference here, of course, is that while Tool’s frontman may fantasize about an apocalyptic event, he’s probably not willing to have an active hand in bringing it about. The Tool example is meant to illustrate the fact that the fantasy of rebooting humanity is quite common and doesn’t in itself make anyone bad. Feelings of deep frustration are natural when you hold human beings to a high standard, and many of us, including myself, have fantasized about how much quicker and easier an apocalyptic event could solve some of our most pressing problems, at least temporarily. It’s one reason why the post-apocalyptic genre and all its subgenres are so popular. It’s the imagined chance to start over and get it right next time. Except the problem is that we wouldn’t get it right next time, not if we were forced to start over, and not unless something else changes first. We could be given a second chance, a third chance, a fourth chance, and we still wouldn’t get it right. And the reason boils down to this: our evolution towards a holistically sustainable mode of living over the long-term (psychologically, socially, and ecologically) must necessarily come by self-initiated choice, something I’ll be arguing throughout the rest of this article. Interestingly, in all the many comics and movies I’ve seen in which a villain makes a compelling case for some sort of final solution, I don’t recall ever seeing an instance in which the opposing hero makes a counter-argument based on efficacy; rather, they typically appeal to the ethics at stake which seems rather futile given that such villains have already decided they’re willing to let ends justify means. Or the hero appeals to the innate potential of humanity to be good (“Yes, they may be overpopulating and destroying everything, but these humans have potential!”). I imagine that for a villain who’s uninterested in ethics or sees himself as transcending conventional morality, it’d be better to make a counterargument centered around the efficacy of the villain’s plan, or the lack thereof: Okay, Thanos, never mind about all the innocent living things that will die. Consider the fact that your plan won’t even work. Villains with grandiose plans seek results. If they knew in advance that the outcome of rebooting the world is that fundamentally nothing would change, would they even bother? All these villains are ruthless but not a single one of them are stupid. But superheroes being paragons of moral virtue, it makes sense narratively to have their counter-arguments rest wholly on ethics. As it is, ethics and morals won’t play a big part in my argument, not because they’re not important but because I’m going to take for granted that most of us would probably agree, without having to get into detailed ethical analyses, that it’d be wrong to wipe out half the population to ensure the survival of the other half. Plus, my self-designated word count will only allow for one full argument, and that argument will be that rebooting the world wouldn’t change anything. But before I offer my rationale, let’s briefly address the question of why it’s legitimately important to talk about the philosophical themes that appear in Infinity War despite the fact that it’s “just” a comic book movie. First, as Jibran Khan points out in The National Review, Thanos’s basic premise is not without some precedent in real life. In 1968, two American scientists by the name of Paul and Anne Ehrlich published a book called The Population Bomb. It’s amusing to imagine this book occupying a permanent spot on Thanos’s nightstand, though the arguments the Ehrlichs make in it are not quite as amusing. In it, they basically make a case for population control by force: “We must have population control at home, hopefully through a system of incentives and penalties, but by compulsion if voluntary methods fail.” Now imagine an audiobook version of this being read by Josh Brolin. Secondly, villains like Thanos, and the apocalyptic scenarios portrayed in films like Infinity War, serve an archetypal function. They intuitively resonate with us as opportunities to reflect on real problems. We may prefer not to dwell over depressing realities in our free time, but the gift of modern myth is that it allows us to do so while being entertained. Geeking out about whether we agree with Thanos or not is not only fun, in a weird way it subconsciously prepares us for a time when we might be faced with the ethical dimension of future technologies and/or policies that, while not as powerful as the Infinity Gauntlet, nevertheless raise some tough philosophical dilemmas. In a previous Hero Wisdom article about Blade Runner 2049, I used the metaphor of our “robot programming,” meaning the combination of biological and cultural imperatives that together influence human behavior. Biological imperatives include innate needs and desires like eating, mating, shelter, and even the need for control over our environment. The desire to have these needs met as much as possible, the concomitant fears that they will not be, and the lack of built-in instincts that tell us when we have enough, can and very often does lead to unsustainable human behavior. Take violence. There are schools of thought within biology, neuroscience, and anthropology that believe that humanity’s capacity for violence, apparent to even the most casual observer, is itself a biological imperative. But there are enough other scientists in these same fields who point to evidence suggesting that social, cultural, and political factors play just as much a role. Anthropologist Napolean Chagnon, for instance, using his studies of the Yanomani people of South America, argued that humans are evolutionarily wired for violence. But fellow anthropologist Brian Ferguson, in critiquing Chagnon’s work, attributes equal, if not more, importance to cultural and social factors. And even some who do subscribe to the biological model, such as anthropologist Richard Wrangham, co-author of Demonic Males: Apes and the Origins of Human Violence, hold that despite this innate predisposition for violence, human beings not only have the ability to control and curtail said violence but it is in their modern evolutionary interests to do so. In other words, with the right kind of positive cultural “programming,” biological tendencies that are unhelpful in the modern era can be overridden. Of course, violence is just one of many problems humanity is plagued with. We could instead use an example closer to Thanos’s concerns, overpopulation, and here too there is a complex interplay of biological and social forces, none of which in themselves predetermine or guarantee anything about our collective future. Nevertheless, the combined power of biological and social forces is so profound that even though human beings are endowed with reason and, arguably, free will, it does sometimes seems like we might as well be programmed robots. Neither our innate biological drives nor the social forces that shape us are likely to dramatically change anytime soon. And this why the world rebooting schemes of those like Thanos will always be doomed to failure. Not because the superheroes will be there to stop them (though that’s true too) but because even if you did wipe out half of society and let the world start over, in a matter of generations the same problems would eventually plague us again. A number of articles published in the wake of Infinity War’s release address the ambivalence many fans feel towards the MCU version of Thanos. Part of the reason for the ambivalence is that Thanos sincerely believes that what he’s doing is for the ultimate good of the universe (though for our purposes here I’ll stick with Earth and human beings). He is not a sadist in that he enjoys inflicting pain. And it is not that he feels no inner conflict; it’s that he believes his means ultimately justify the end. I’m pleased that the popularity of Infinity War has been inspiring a surge of interest in real life philosophy. Most of the articles and discussions I’ve seen online have revolved around ideas and terminology associated with Western philosophy—concepts like utilitarianism, Malthusian catastrophes, consequentialism, and of course nihilism. Since fans and students of philosophy typically have their biases and loyalties, I should start by coming clean about my own. For the rest of this article I will be writing from the viewpoint of philosophical Taoism (different from religious Taoism) and its perspective on matters involving human behavior, social progress, and sustainability (both social and ecological). It seems appropriate given how much Thanos yammers on about “balance” in the movie, enough for TVTrops.org editors to speculate the ways in which Taoist themes appear in the film. I won’t talk about balance here because it’s actually not nearly as central or important an idea in philosophical Taoism as popular media makes it out to be. Instead, I’ll discuss embedded patterns of human psychology and behavior, which from the Taoist viewpoint cause most of the world’s biggest problems at both the individual and societal level, including the problem Thanos has made it his life’s calling to solve. But rarely can the root of these problems be solved in the long run using external pressure or force. Certainly, there are situations in which some external pressure in the form of, say, laws and legislation, are both desirable and necessary to try to minimize the level of violence, chaos, and unfairness in society. But in themselves such laws do not fully prevent the problems they address, as we all know, nor are they able to address the causal roots. 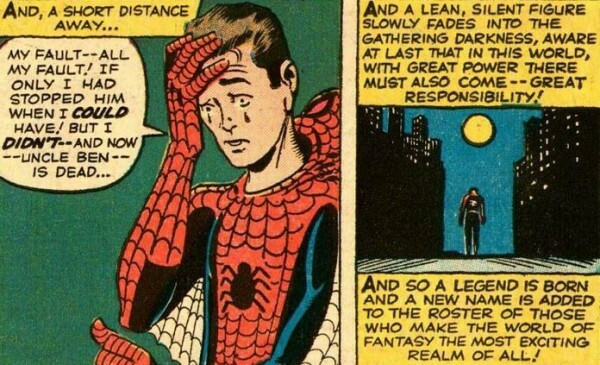 Fortunately, in most cases laws in and of themselves don’t mandate the indiscriminate slaughter of innocent people which is why superheroes don’t typically oppose laws directly (with occasional exceptions as in Marvel’s Civil War comics). Thanos’s apocalyptic dreams of rebooting the world, on the other hand, go far beyond laws designed to encourage prosocial behavior. Like some cosmic version of The Punisher, he plays judge, jury, and executioner without giving humanity a chance to correct itself. From a Taoist perspective humanity’s ultimate salvation can only occur if it is self-chosen and self-initiated. Society cannot be changed overnight, and it certainly cannot ever be changed by brute external force. Rather, it must be a slow, gradual change in which individuals one by one must make a series of deliberate decisions to evolve. Even making the choice to evolve doesn’t guarantee that they’ll be able to do the hard work necessary. Nevertheless, this is what is required. Eventually, when there are enough individuals doing this to reach critical mass, that is when lasting sustainability can occur. Despite the aforementioned difficulty of change, Taoism holds that it is possible. My Taoist teacher once said something to me along the lines of, “If you learn just one thing from me, let it be that you can change, that people can change, and that you have far more power over your own behavior and actions than you yet realize.” He was saying this in response to my complaint that I was always making the same mistakes over and over again. Years later, I can proudly say that he was right. With his help, I did change. Now we’ve all heard someone say at some point that people can never change, but in Taoism the adoption of such a belief is the skirting of responsibility and hard work. Since changing deeply rooted patterns of thinking and doing is one of the most difficult things a person can do, it is easier to let ourselves off the hook by imagining that our behavior is biologically and culturally predetermined. Why then, does it often seem that people are unable to change, even if they sincerely wish to? While there are many factors, at the absolute simplest level it comes down to a matter of ignorance—not knowing the true nature of reality, not knowing the true nature of mind, and many other kinds of ignorance. In this the major Eastern philosophical traditions—Taoism, Buddhism, Hinduism, and all their sub-traditions— are all on the same page. Ignorance, say these traditions, is the deepest root cause of most of humanity’s problems (though they may differ regarding the prescribed remedies for this ignorance). The degree of psychological evolution necessary for a way of life that is truly sustainable over the long-term is so great that the only way we can succeed is if we do the work and make the necessary sacrifices out of intrinsic motivation. No one outside of ourselves can ever impose such an evolution upon us. Or rather, someone could impose it, but that would remove the element of personal choice and responsibility, without which, according to Taoism, genuine psychological evolution cannot happen. Thus, after Thanos succeeds in rebooting the world, it would only be a matter of time before humanity will be back where it was before, with all the same problems. Thanos’s dialogue makes it clear that what he seeks are long-term results, not short-term results. By his own standards, therefore, his plan would be a failure. One could ask: But what if humanity doesn’t get its collective act together in time and then EVERYBODY dies due to our inaction? Wouldn’t a Thanosian intervention be warranted in that case? The Taoist answer to that is something I don’t have enough room left to discuss in detail, but in a nutshell it involves free will and the awesome responsibility that comes with that free will. It’s like having the democratic right to vote which also includes, by extension, the right to not vote, even if by not voting one would be allowing the degradation of that very democracy. Free will is both a blessing and a burden because the responsibility of it goes both ways. According to this view, if we as a species cannot collectively get our act together to save ourselves, despite fully having the power to do so (“With great power comes…”), then not only will we have freely chosen our own end, we would essentially “deserve” that end by virtue of our choice. Collectively accepting the consequences we have chosen, and letting everyone on Earth enjoy the time they have left, would arguably be fairer and more ethical than penalizing half and letting the other half remain unaccountable and continue with their unsustainable ways. But wouldn’t some survivors be better than none? It’s hard to argue with the idea that some survivors are better than none if there’s no context. But if we’re talking about preemptively taking Thanosian measures to ensure those survivors, then there are problems. First, despite proclamations that it’s already too late for humanity by scientists like British chemist James Lovelock and Australian microbiologist Frank Fenner, there is enough disagreement about this from other scientists that a reasonable conclusion for a layperson to draw is that we don’t know anything for sure yet. The future is still open, though the time we have left to decide may be limited. The late Stephen Hawking felt we had about 100 years left which, to him, warranted an urgent situation, but it certainly affords us a larger window of time for self-correcting our course than the “too late” idea. A lot can happen in a hundred years. Another problem with the “some survivors are better than none” idea is that, as I’ve argued throughout this essay, even if we completely ignore the ethical issues of a Thanosian intervention, the plain truth of the matter is that it simply wouldn’t work anyway. For a few generations we might be comforted by the illusion of salvation, only to later find that little about humans has actually changed and that we are once again faced with the same threats. So even if some survivors are better than none, a Thanosian intervention would in the long run leave us with no survivors as well. Because, you know, human nature. Therefore, wouldn’t it be better to choose the path of long-term sustainability even if our success isn’t guaranteed? In Infinity War, Doctor Strange, while in trance, saw that there was only one out of 14,000,605 possible future outcomes in which he and the Avengers succeeded in stopping Thanos. But the path our heroes must take is clear: they’re going to go for that one out-of-14,000,605 chance. I’m no scientist, but I would venture to guess that the odds we face in real life are a little better than that.